These spoons are perfect for any occasion. They are very sturdy and very pretty. I like to wrap them in a color napkins to give them a good look. A lot of my clients ask for clear spoons. I purchased these for an ice cream bar where we were serving re-packed hard ice cream. I was worried about them breaking but they were perfect. Wouldn't hesitate to purchase these again! Bought these for the office to use and you cant beat them!! These are THE MOST strong disposable plastic utensils I have ever used!! There is nothing worse then being excited about your lunch and having your utensils break in half when you go to cut or pick up your food. We all love these and will only purchase these from now on. great product. Very sturdy. I use these everyday. Only some of the spoons have An opaque look to them where they're not perfectly clear but that doesn't bother me. I have a coffee station in my kitchen and I use disposable spoons. These are great. They are sturdy so I don’t have to worry about breaking them and I can also wash them and reuse them if I want. I couldn’t be more pleased with the quality of this product and the price makes them a great value. Perfect for large events or even just to keep stock on disposables at home. They are sturdy and a higher quality than you can purchase at your local store. I will definitely order again! These spoons are great! They are not flimsy at all and they hold up well to our ice cream. We have had a lot of trouble finding the right spoons but our customers are happy with these. Definitely would recommend. Again, as with the other flatware that matches this, this is a great product. It is sturdy, well priced, and the design isn't overwhelming or distracting like some can be. They are heavy duty plastic, we use them for small parties in our office. The option of 100 units works well and at the best price. VERY strong and durable plastic spoons. They are tough enough for the hardest ice cream, yet still cheap enough to afford as disposable ware. 5 stars for sure. These are of a good quality for an excellent price! We recommend that you try these disposable spoons! Heavy weight and pretty much good for any serving! 4 stars! While I would consider these spoons to be a step above a cheap version of plastic ware...I would not consider them to be as sturdy as some of your higher end heavy weight plastic spoons. If you are planning on using the spoon to serve anything that may require exerting a medium to high level of force, I would purchase a higher quality product as this spoon would most likely break. In fact, we used them for a wedding reception where we served frozen fried ice-cream, and if the ice-cream ball was on the less thawed side, the spoon snapped in two. However, if using for something light such as yogurt or a soft ice cream...this spoon is perfect! And, you CANNOT BEAT THE PRICE!!!! These spoons are very durable and did exceptionally well for my graduation party. I would highly recommend these for large parties and events. These spoons are very clear and they go with any theme!! All spoons are not created equal. This spoon is a fabulously sturdy option for a plastic spoon. It will not break even on the hardest frozen ice cream we have in the freezer. The small flimsy white options at the grocery are about 2 dollars for 50 or 60 spoons, the price or the quality don't compare to these. While these aren't the sturdiest spoons ever they are definitely worth the price paid for them. These are great for desserts and other light items, will probably order again. Not as multifaceted as the spork, but it comes close! Use this heavy duty fork to scoop, dollop, or even eat. The sky is the limit! Heavy duty says it all. We were looking for silverware to hold up for our bbq and these were perfect. I just wish they were a little more eco friendly. These teaspoons are a good value for the money. We have used these for several events and not had any problems. We will definitely by these again! These spoons are nice and heavy feeling. We will be using them at our parties and for many social gatherings after. What a great price! Great spoon. No school utensil here. it is strong and hold up well when uses for hot foods and soup. No bending or twisting. The value cannot be beat. I have bought many plastic spoons in my life, and I can honestly say that I love the sturdyness of this spoons! I keep buying them from here because they are great quality for the price! Great teaspoon for to-go orders. We have them at our coffee and tea shop and give them with fruit parfaits and other items. Great value too! These are very sturdy spoons! Our guest had much fun and no one had to worry about flimsy cutlery. Even used them with the coffee service. The HOT did not bother these. They are long enough and DOES NOT feel as it is going to bend. The clear goes with any decor! This is why we chose them and will purchase again. Thanks again for a quality product! These spoons are great for use in some of our banquets. We use the plastic-ware when we have large groups of people or other events. They are great quality and they don't feel "cheap" even though they are very reasonably priced. The item is ok, it's not bad but not what i was expecting, I chose the heavy weight thinking it would be a little stronger. Much heavier duty than I expected at that price point. Cheaper than buying local. Quick and affordable shipping, will be buying many more in near future ! These spoons are nice and sturdy feeling. We will be using them at our wedding events and for many social gatherings after. What a great price! The heavy weight is perfect for our ice cream shop. No complaints or returns due to breakage. Will reorder again definitely and the price is right. A lovely clear heavy weight plastic teaspoon that is extremely strong and well built. It is perfect for eating ice cream and frozen yogurt. Looks great! These clear spoons are solid and strong and durable enough to use with ice cream and frozen treats. Has the perfect shape for eating with comfort. These spoons will work perfect for my ice cream bar! They are nice and heavy and they were delivered quickly! I would definitely order these again! These clear plastic spoons are inexpensive yet very sturdy. They have become the perfect addition to our take out cutlery in the Cafe we just opened. Nice look with it being clear plastic and very durable with them being the heavy weight. They worked very well with the food we had chosen to serve. Clear vision cutlery is a nice weight of cutlery. Used it for reception dinner at wedding. Fork didn't break when cutting food and held up well. The Visions Clear Heavy Weight Plastic Teaspoons are excellent. The quality is great, they are very heavy duty. I like to send them to school and work with cold lunches. These spoons are a great value. we love this line of plastic ware. very durable so doesn't bend or break easily. heavy weight so great for even tough to cut foods! High quality spoons that were a good weight (not flimsy). Definitely a great purchase for the cost- less expensive than the big box stores and comparable overall. We use these utensils on our buffet tables. The heavy weight plastic makes for a very strong eating utensil. We will be purchasing more in the future as we need them! This is a great product! 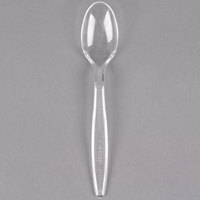 This clear heavy weight plastic teaspoons are really strong. They don't bend easily so they won't break easily! They are clear and worked great with ice cream dishes. These spoons are a great price and product. They are very durable and I use them on a daily basis in my junior chef cooking classes. Highly recommend. The plastic spoons held up well for the reception for which they were purchased. The delivery was timely and I will use this service again. These are great spoons. I like the heavy weight spoons the will stand up to whatever food your eating. I ordered 400 of these for a birthday party for appetizers and cake. Pretty good quality and I wasn't disappointed with the purchase, would defiantly order again in future. The best spoons! Perfect for hard ice cream. These are nice and sturdy and love how they are clear. Love the look and they are high quality. The product arrived quickly, packed well, there were no broken items, great price, better than purchasing from warehouse club for the quantity, used for all occasions, would highly recommend. This was a great buy 1000 spoons for a low price! These are just as mentioned heavy weight quality spoon. I love the clear look that gives you the option for any occasion. I love the clears spoons. My family and I used it for my personal use as well at home. So no watching too many spoons anymore. We used this plastic spoon for yogurt cups sold at a coffee shop. The spoons gave an upscale feel to our premium priced yogurt cups. Good sized plastic spoon. Felt right in the hand (not too small like some brands), and the bowl of the spoon seemed to be an appropriate size too. Not so large it felt like a soup spoon, but not so small you felt like nothing was staying on it. We purchased these spoons for customers who wanted to eat their scones, muffins, cheesecakes, etc in the bakery. They are very sturdy and we will purchase again. Wish they made a soup spoon with this same quality. Very pretty clear spoons. They are strong and can hold a lot of weight. I have used them on hot soups and ice cream, they worked great. Wow I couldn't believe it when I received the items they are good quality and a lot of spoons in a pack easy to use too. Great spoons for the price! These rarely break and work well for filling up our dressing bottles. These are not very deep, so make sure to go with an actual soup spoon if you intend to use them for soup! Used the Visions Clear Heavy Weight Plastic Teaspoon to pick up a teaspoon pistachios. Easily put this teaspoon with the pistachios and use for serving. Nice. These are excellent grade disposbale spoons, great for any party or gathering.. And for that price I would definitely recommend them anyone who are looking for these. These are a great quality of spoons. They are strong, durable and much cheaper then I have found at the wholesale clubs. They hold up with any type of food and they look nice too. I would recommend them. These are very heavy duty spoons. They are free from burs and rough edges. They hold up well to heat and dont get soft when hot. Sturdy and strong enough for the thickest soups and desserts, these spoons are a great value and come in a convenient package size for smaller shops. These are really nice and very durable plastic ware. I would recommend them for any occasion. I used them for a birthday dinner where soul food was the menu and they did not break. These were another item that we were used to just buying at the local super store here in town, but the pricing was much better here and I was hoping the quality was too...and they certainly were! Nice and heavy-weight, just like the description. I love these heavy duty plastic teaspoons. They are very sturdy and do not break upon use. These have proven to be a great quality product at a very minimal cost compared to what's available here locally through large box stores. We use them primarily for fresh fruit sorbet and ice cream and they've worked great thus far. No complaints! These spoons are the perfect accompaniment to the fork and knives of the same company. Whether it's stirring a cup of coffee, or tea or tasting all at a Chili cook-off these are the perfect utensil. Used for a wedding. Not like all these cheap flimsy spoons that break so easily,They are sturdy and heavy weight. Great for any occasion! I would recommend for all occasions. Good quality and can not touch the great price that this web site offers. They are so sturdy you can run them through the dishwasher and use a few more tines. this is good looking high quality plastic ware. customers seems to like it and it doesn't look cheap. We use these also in the kitchen as tasting spoons and we reuse them, they wash and hold up well.